Need a refreshing and simple salad? 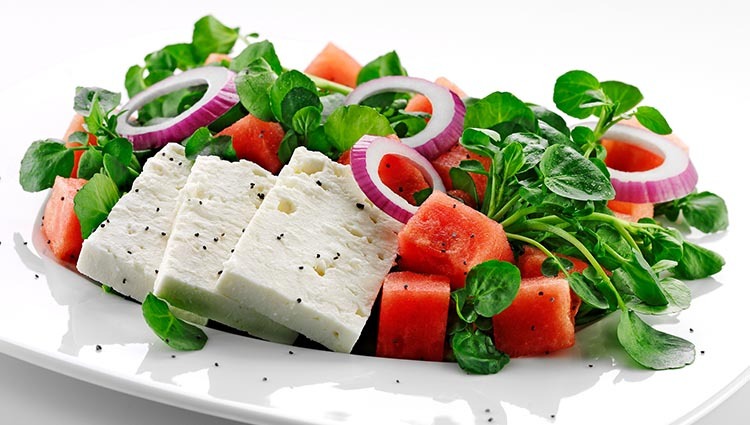 Look not further than our Feta Watermelon with a Champagne vinaigrette! Photo and recipe copyright Dairy Farmers of Wisconsin. Combine vinaigrette ingredients in small bow I; whisk to combine. In medium bow I, toss watermelon and watercress with 3 tablespoons vinaigrette; arrange on plate. Top with Feta and red onion; drizzle remaining dressing over cheese. Sprinkle with poppy seeds before serving.